IN JULY, 1896, the old Woodbury Granite Company was taken over by John S. Holden, Charles W. Leonard, and George H. Bickford. The first winter under the new management, two small derricks were erected on the granite ledge on Robeson Mountain. There were eleven men on the pay-roll. 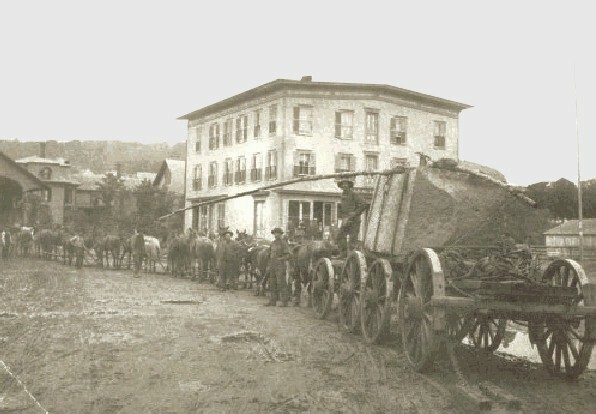 The blocks were loosened from the solid sheets by hand drilling, loaded on wagons, and hauled eight miles, over rough roads, to the St. Johnsbury & Lake Champlain Railroad station at Hardwick for shipment. That is how Hardwick first came prominently into the granite field as a shipping point. The following year the Hardwick & Woodbury Railroad was completed as a means of connecting the quarries of the Woodbury Granite Company and the Fletcher Granite Company on Robeson Mountain more directly with the outer world. 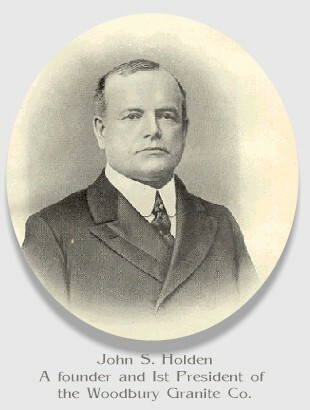 The stock of the road was floated partly by popular subscription, but mainly by the backing of John S. Holden and his associates. Nine miles of track had to be built to reach the quarries (since increased to fifteen miles) and the grades were such that no ordinary engine could be coaxed to climb them. Undaunted, a mountain-climbing engine of the Shay-geared type was purchased and the road put into operation. Given the railroad, the quarries began to develop rapidly. The demand for Woodbury Gray Granite increased, but it was soon realized that the market for granite sold only in the rough must be broadened, or the quarries would have to be abandoned as an unprofitable enterprise. 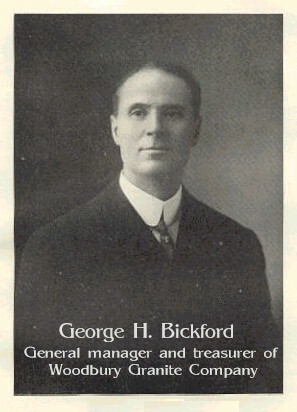 In 1899, the firm of Bickford, More & Company was formed, composed of George H. Bickford, Charles H. More, John S. Holden and Charles W. Leonard. Their idea was that they should manufacture the granite and sell it to the retail trade in finished form. Land was acquired in Hardwick and a two hundred foot shed erected on the line of the Hardwick & Woodbury Railroad. As an outlet for the quarried product, the firm of Bickford, More & Company was a success from the start, and from small monumental work, the firm began to reach out for small building jobs. The growth of the business incessantly swallowed up its working capital and its profits in improvements. Number two shed was added to Number one; additional saw gangs and another huge McDonald surfacing machine were installed, and a powerhouse and boilers were housed in an annex. 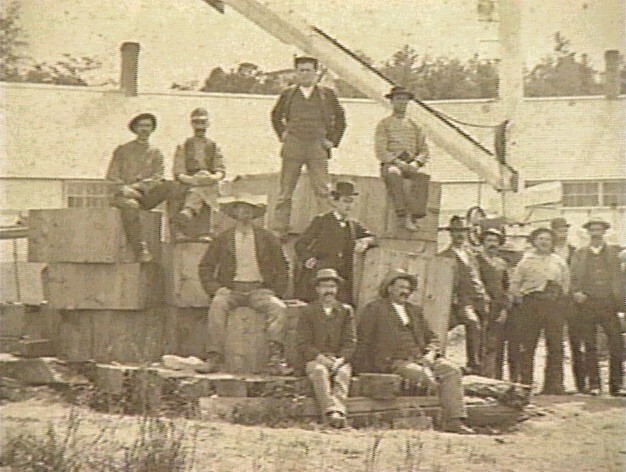 The demand for more direct connection with the quarries led to a reorganization in 1902, and again the combined faith of the active members of the two companies was behind the venture. 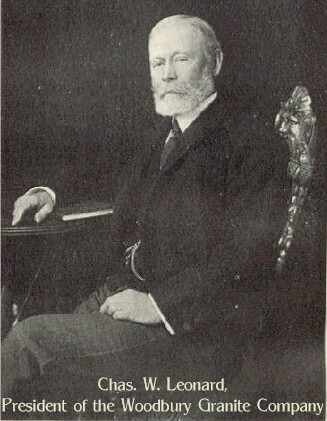 Bickford, More & Company was merged into common ownership with the quarry, and the Woodbury Granite Company assumed control of the plant at Hardwick as well as the quarry ledge. In 1903, the contract for the Pennsylvania State Capitol came into the market. Calling, as it did, for 400,000 cubic feet of stone to be furnished and set in place in the extraordinary time of twenty-four months, it was an undertaking to appall even well-established firms. The conditions of the contract were said to be impossible. Certainly no one outside of Hardwick dreamed that a company in Vermont, backed by only two sheds and a partly opened quarry, would dare bid on the work. With a faith that seemed foolhardiness, but which proved to be genius, the management saw the vision of what might be. The members of the firm pledged their personal resources to the enterprise; the plans were figured; and to the surprise of the coast quarrymen who were not looking for inland competition, the Woodbury Granite Company's figures landed the contract. Continuous deliveries must be made, for the building could not be delayed. How it was done is one of the romances of Vermont business history. The details are of little importance now. Suffice it to say the requirements were met to the letter. Inside of eight months the stone was being furnished on contract time. By the end of the first year the quarry and plant were ahead. During the first eight months of the second year, thirty huge monolithic columns, 30 ft. long, were quarried, finished in the big lathe, and shipped for the job. The twenty-second month found the work shipped and set complete, with two months still remaining, unneeded. The feat was unprecedented, and the company's fame was established. sheds by the R.R. tracks circa 1890. Since that time the company's motto has been equipment and efficiency. In the past six years, over $500,000 has been expended in derricks, machinery, overhead cranes, and the latest improved stone working tools. In 1907, the water power rights of T. T. Daniell at Mackville, Nichols Pond, and East Long Pond were acquired, new dams built, generators installed, and the cutting shops at Hardwick equipped with individual motor drives to each machine. This development is still in progress. It is obvious that a company that started with an absolutely undeveloped quarry and with no cutting plant whatever, and in fifteen years time has built up what is admitted to be the largest granite business in the world under a single management must stand for some principle that means something to the trade. The secret of its success lies in the efficiency of its organization and the end and aim of that organization has always been to accomplish three things:¾ economy of production, speed of output, and a product satisfactory to its customers. That it has been able to satisfy its customers is amply proven by the phenomenal growth of its business and by the fact that it has been so successful in retaining its old customers as well as in securing new ones. So rapidly has it extended and improved its plants, and so various are the improvements now under way that it is almost impossible to give a description of the works. The company has its own timber lands and operates its own saw mill for the production of its dimension timber and for boxing and crating the granite produced at its Hardwick plant. It owns its own water power plant at Hardwick, developed for 1000 H. P., with an extensive system of water storage for the development of electric power, with which it operates its cutting plant at Hardwick. On this same power it also operates two of its extensive quarries in Woodbury. Here, too, alongside its water power plant, it has a complete and up-to-date steam plant equipped with Sterling boilers and a Turbo-generator set good for 2,000 H. P. for auxiliary use, to avoid any possible interruption of its production for want of power. A glance at the plant at Hardwick reveals a large and well-lighted office building, in which are housed the various heads of the departments, its drafting force, etc., and some idea of the volume of the business done can be gained from the fact that it employs in its drafting department alone, twenty or more skilled draftsmen, besides its estimators, cost clerks, etc. 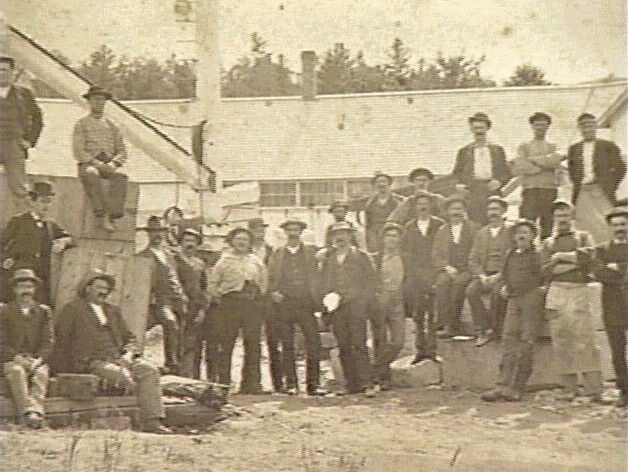 At this plant, we find three mammoth cutting sheds besides other smaller ones, including carving sheds, blacksmith shops, job and machine shops, carpenter shops, grinding rooms, big air compressors, etc.¾ in short, all the necessary equipment for the employment at this plant alone of over five hundred men. Here, too, is the company's main storehouse for supplies, which is larger and more crowded than the ordinary country store. In the main cutting shed is found a greater assortment of up-to-date machinery than can be found in any other granite plant in the world. Here is one of the two big McDonald surfacing machines, costing $8,000 each, of which the company has four out of a total of less than a dozen in existence. Here, too, are polishing lathes, gang saws, carborundum saws, and the largest stone turning lathes in the world, among them one just installed capable of taking in a stone 36 ft. long and 8 ft. 6 in. in diameter. That the company is on the alert for the utmost speed and efficiency of production is nowhere more apparent than under its immense runway, 870 ft. long and 75 ft. wide, This runway is equipped with two electric-driven steel cranes, each good for thirty tons capacity. Under it are eighteen tracks, on each of which can be placed two or more cars simultaneously. Here one can feel the very heart throb of the whole plant, ¾as it is here that everything centers. Under this runway must come nearly all raw material used in the plant, and from it must be loaded nearly all of its finished product. This extraordinary provision for unlimited storage and rapid shipment of its product is without a parallel in the stone trade, and it has had much to do with the rapid delivery records of the company of which the management is justly proud. Extending from this runway are soon to be built three other immense sheds, all under the same roof and each equipped with steel cranes, which will practically double the possible output of the plant. That the company is also alert to the necessity of finding an outlet for its waste materials is proven by its extensive equipment for making paving blocks on one side of the plant, where thirty to fifty paving cutters are provided for under twin cableways, each of five tons capacity, and by its extensive crushing plant on the other side of the works with a capacity of two hundred tons a day. But immense cutting plants and extensive equipment, however perfect they may be, are of little value unless backed up by equally extensive quarries of a quality and grade of granite that will meet the demands of the trade. A visit to the quarries at Woodbury, eight miles from Hardwick, is sufficient to convince one that here are located some of the finest granite quarries in the world, and that in the extent of the deposits and the quality of the gray granite found in the oldest of its three quarries located in Woodbury, the company has found the strongest justification for the extensive improvements at Hardwick and for the faith it has always had in the future of the business. From this quarry is taken its regular gray granite, known to the trade as " Woodbury Gray," and it is to the credit of the company that in the ten years it has been engaged in the production of this granite for building purposes it has brought it to the point where it has come to be recognized as one of the three or four granites of this country accepted as standards. There are very few of the largest building contracts let that do not have to reckon with this granite in active competition. Here, too, is produced the grade of the gray granite, known to the monumental trade as the "Bashaw Granite," and made famous as "the trade marked stone," the purpose of the trade mark being to concentrate upon this stone the cumulative effects of the extensive advertising campaign inaugurated by the company. The results were so apparent that it has since trademarked its other granites for monumental purposes the "Imperial Blue," "Peerless White" (or Bethel Granite) ,"and the "Vermont White" each one of which has some strong and distinctive characteristic of color or grain. At the Gray Quarry of the company are located ten immense derricks, several cableways, a central power plant with its big air compressor, blacksmith shops, engine houses, office, etc., all on the largest scale for it is here that many a record has been broken in the time required for the production of big building contracts or in the quarrying of some single stone of unusual size. From these quarries and from the cutting plants at Hardwick have been produced such monumental buildings as the Chicago City Hall, Cook County Court House, Chicago; Pennsylvania State Capitol, the Providence, Minneapolis and Grand Rapids Post Offices, and it is the proud distinction of this quarry to have produced granite for four state capitols, those of Pennsylvania, Kentucky, Iowa and Idaho. During the single year of 1910 it produced the granite for twenty-four post offices, and for 1911, twenty-six post offices, which fact alone would seem to be ample proof that the "Woodbury Gray Granite" has come to be recognized as a standard stone and to bear the stamp of Government approval. A description of the quarry is difficult and in fact almost impossible, as it changes so constantly, but at this quarry could be seen in one of its openings a single sheet of flawless stone five hundred feet long, twenty to thirty feet deep, and twenty to fifty feet in width. This alone of all the company's quarries and cutting plants is operated by steam. 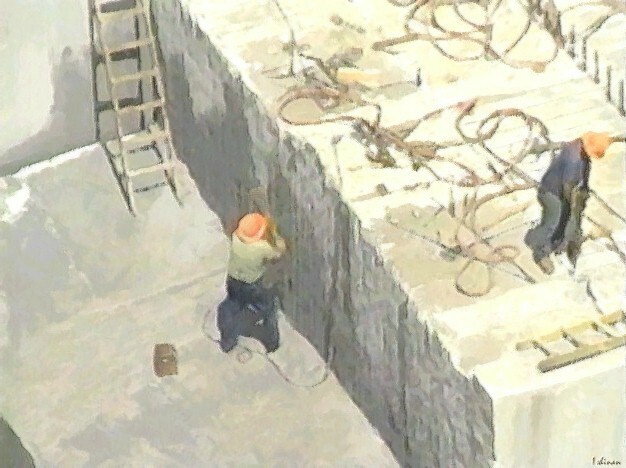 About a mile from the Gray Quarry is located the ledge from which is being quarried the "Vermont White" granite. 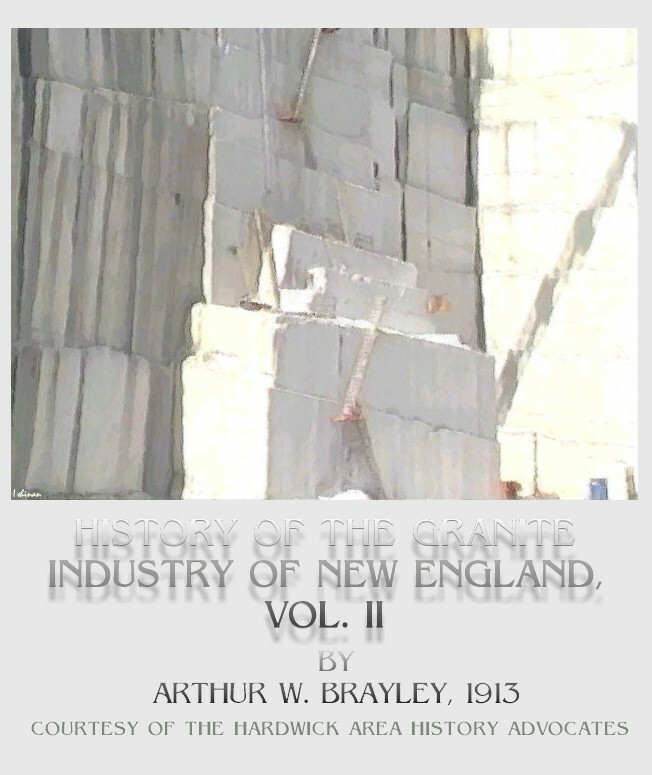 This is a new quarry opened in 1912 and from it is being produced a remarkably white granite the whitest, perhaps, of all the granites, with the single exception of the Bethel granite produced by this same company at Bethel, Vermont. The ledge is of unusual promise, both as to quality of stock and the extent of the ledge, and already contracts have been taken in this granite for some very large and monumental buildings. At this quarry are already in operation eight big derricks run by mammoth electric hoists, and there is every indication that it will soon develop into one of the largest quarry properties in the country. About a third of a mile farther on is located the dark gray ledge from which is taken a beautiful monumental stone known as the "Imperial Blue." Like the "Vermont White," this is a newly developed ledge of remarkable promise. Both quarries are located on spurs of the Hardwick & Woodbury Railroad, controlled by the company. Like the "White," the Blue Quarry is operated with electric hoists. An air compressor plant, motor driven, supplies the air required for both quarries. Here, too, is located an auxiliary steam plant with steam compressor for emergencies. The "Imperial Blue" granite promises to take high rank among the darker granites used for polished monumental work, being even darker in shade and finer in texture than the best dark Barre. 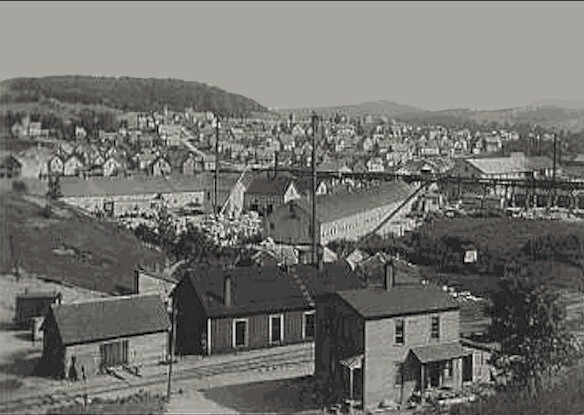 In 1903, the company purchased quarry property at Bethel, Vermont, sixty miles south of Hardwick, and began there the erection of a cutting plant which has grown to be second only in size to that at Hardwick. The same business insight and aggressive policy which has made Hardwick the leading building granite centre of the country has made itself felt at Bethel in the production of the unique white granite quarried there and it is fast making the name "Bethel" a household word in the granite industry because of the superior excellence of the stone; for Bethel granite has the proud distinction of being the whitest known granite as well as the hardest, and hence most expensive, of any of the granites used for commercial purposes. A visit to the Bethel quarries reveals a beautiful formation of pure white granite of a soft, mellow shade that easily puts it into q class by itself. The sheets run in thickness from a few inches to eight or ten feet. The quarry is equipped with several large derricks, electric hoists, electric-driven air compressors, and thoroughly modern and up-to-date equipment. This granite is shipped in the rough by rail to the cutting plant, located in Bethel village. Here can be seen what may be considered the "last word" in the equipment of a granite plant. Everything is electric driven, the power being furnished by the company's own power plants, two of them, each good for 600 H. P. From these same power plants is also developed the power required at night for the lighting of four towns and villages, Bethel, Randolph, Randolph Center and Gaysville. These water power plants, together with an auxiliary steam plant, with an engine capacity of 1,000 H. P. and a boiler and electrical capacity of 500 H. P., are owned by the Gaysville Electric Light and Power Company, a subsidiary company owned by the Woodbury Granite Company. At the Bethel plant are four big cutting sheds (three of them under a single roof), a big steel runway, two hundred feet long, seventy-five feet wide, for storage of granite and for shipping, and another runway two hundred and fifty feet long and sixty feet wide. On the runway and in the sheds are in operation five big steel cranes, electric-driven, ranging in capacity from ten to thirty tons. Here are big compressors, two McDonald surfacing machines, large lathes, second only in size to those at Hardwick, machine shops, and blacksmith shops, built of concrete blocks, three big Pirie sharpening machines (a recent invention for sharpening cutters' tools), and many other devices for reducing the cost of production and for increasing the output. For here, as at Hardwick and Woodbury, is found abundant proof of the same efficient business organization, striving always to accomplish its purpose of securing economy of production, speed of output and a product satisfactory to its customers. If anything more were needed to prove that it has accomplished its purpose, we need only mention some of the monumental buildings it is now actually at work upon, making a grand total of fully $4,000,000 of unfinished work: The Wisconsin State Capitol, Madison, Wis.; Pro-Cathedral, Minneapolis, Minn.; Turk's Head Office Building, Providence, R. I.; Post Office, Washington, D. C.; Miners' Bank Building, Wilkesbarre, Pa., and Hartford City Hall, Hartford, Conn., and the twenty-nine story Western Union Telegraph Building to be erected at the corner of Broadway and Dey streets, New York City, at a cost of over $1,000,000; all the above of Bethel granite. Minneapolis Post Office, Minneapolis, Minn.; Public Monuments at Bloomington, Ill., Princeton, Ill., and Madison, Wis.; and a portion of Bankers' Trust Company Building, in New York city¾all in the Woodbury Gray or Bashaw granite. Home Office Building for North Western Life Insurance Company, Milwaukee, Wis.; Museum of Fine Arts, Minneapolis, Minn., and Soldiers' and Sailors' Monument, Wichita, Kan. in the "Vermont White" granite.